Spin doctor. Or rather: Spin. DOCTOR! If while at the office or at school you've spent a good deal of your time spinning around in a chair, you might have wondered how you could take it up to the next level. Get someone else to spin you? Add oil to the chair to make it looser? How about adding two canisters of nitrous oxide? Yes, that one. 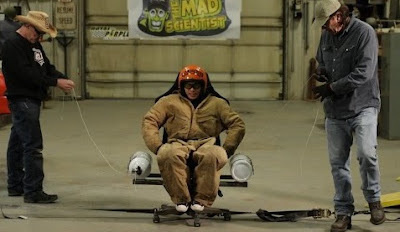 That is precisely what Farmtruck, Anz, and The Mad Scientist did, creating The Nitro Chair; an office swivel chair with two opposing propellant tanks strapped to it. As you can see in the vid, the rotations are pretty immense, and there seems to be genuine concern on everyone's faces - especially the spinning dude.